Koronja or Koroch (pongamia pinnata, family: fabaceae) is a moderate-sized deciduous tree, attaining a height of 10-12 m, with spreading branches. Bark is soft and grey, covered with tubercles. It is suitable for roadside plantation and for parks and gardens. The indigenous tree is found in the forests of Chittagong & Chittagong Hill Tracts, Cox's Bazar, Sylhet & Khulna. 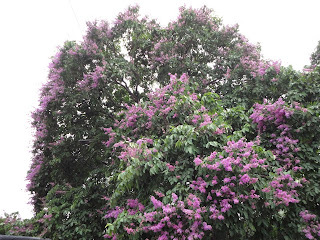 The water-loving tree is also found in lowlands of the country. During the rainy season, the tree is seen standing in the water at those places like Hijol (Indian oak, barringtonia acutangula). English name of the plant is Indian Beech Tree. By the by, the other local name of the plant is Titgila. Leaves are compound, 15-25 cm long, leaflets 5-7, shinny, dark green, opposite, ovate or elliptical, 10-15 cm long, 6-8 cm wide. The beautiful, reddish new leaves arrive in the month of March. Flower is pinkish white or purplish, Green Pea-like, 1.2 cm long on short axillary raceme. The plant produces flower in April-May. Fruit is a pod, almost flat, copper-colored, 4-5 cm long & 2-3 cm wide, 1-3-seeded, indehiscent, long-lasting; Until the new leaves arrive in the next year, the fruits hang on the tree. Propagation is caused by fresh seeds and cuttings. Different parts of the tree are used as popular folk medicine in Bangladesh as well as Indian subcontinent. Root is useful in worm infection, fever, gonorrhea and rheumatism and sore. Seed-oil is stimulant and insecticide and it is used in removing cough and phlegm and for burning.